KATIE: Pssst... I'm about to give Waffles his first lesson in the laws of cat scratcher ownership. I don't have much faith that he'll understand, let alone remember today's class. But in an effort to make my world a better place, I must try. KATIE: Waffles at 2 o'clock. WAFFLES: Hey Boss. Whatcha doing? 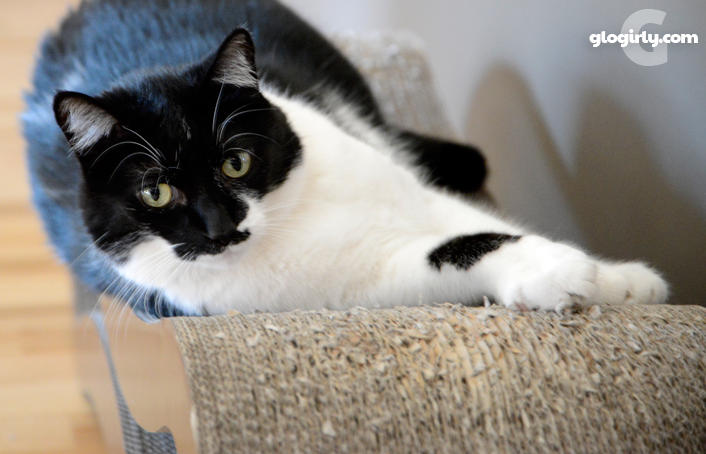 KATIE: Lounging on my scratcher. 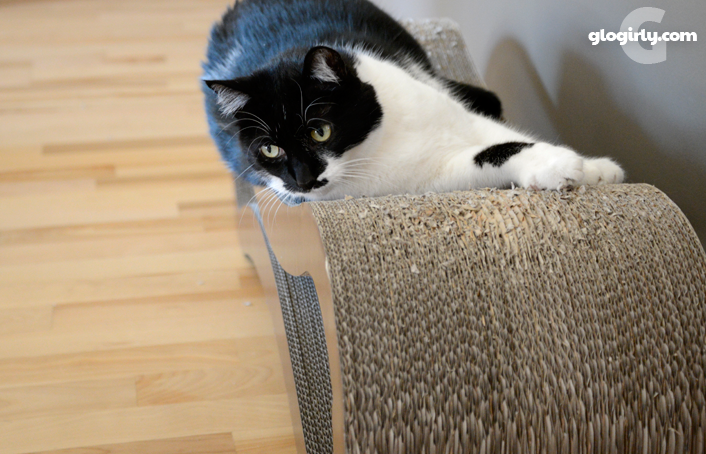 WAFFLES: Can I lounge on the scratcher? KATIE: You mean on my scratcher? 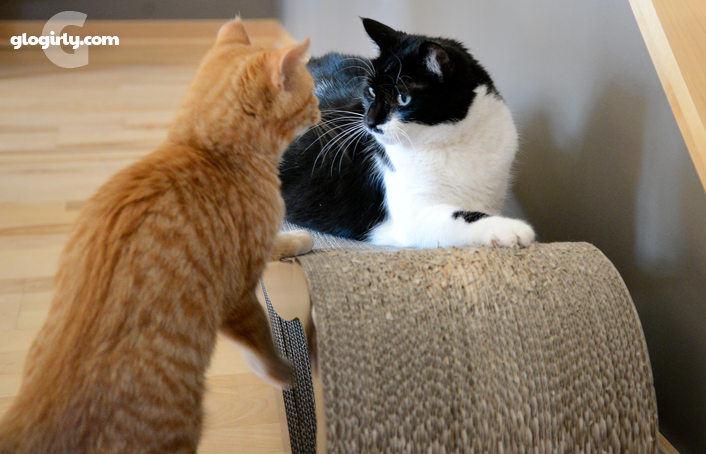 WAFFLES: How do you know it's your scratcher and not my scratcher? WAFFLES: Ok, I don't mind. KATIE: That's not what I meant, Waffles. When it comes to stuff like scratchers, possession is nine-tenths of the law. That means this scratcher is mine. WAFFLES: So you have to do math to get stuff??? Like 1 + 1 = 11??? KATIE: Yeah, good luck with that Waffles. WAFFLES: Glogirly says all I have to do is look cute and I can have whatever I want. Cute is WAY better than math. 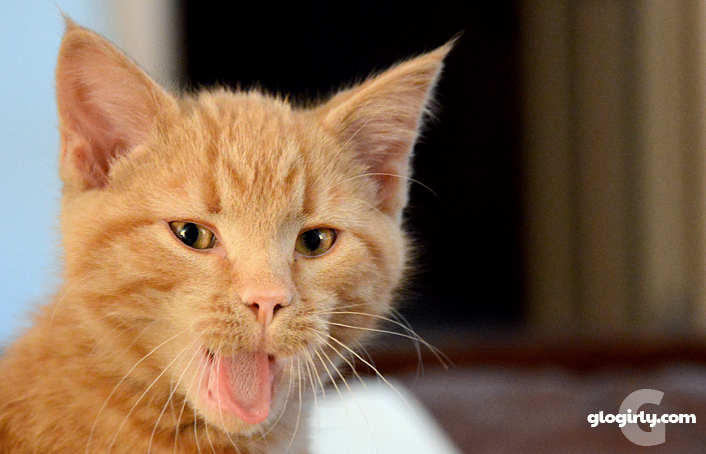 Waffles was still learning the ropes when these photos were taken back in January of 2013. He was barely 4 months old. Katie had her paws full trying keep him off of her stuff. That first scratcher lesson didn't go too well. What Waffles lacked in etiquette, he made up for in confidence. Both he and Katie have come a long way. Waffles shows Katie selective respect. And Katie shows Waffles selective tolerance. Selective though, is the operative word. I have to say, Waffles was right - cute DOES get you a whole lot! Cute is better dan math, I agrees! Yes, cuteness goes far. We use selective respect and tolerance too. Looking cute does go a long way to getting what you want. Cute is WAY better than math any day, Waffles. You got that right! Waffles has the cute mastered. I'm finding these orange cats are enormously persistent! I hope Waffles got his own scratcher by now. We had to laugh, we have a lot of selective stuff going on here too. If you look cute enough, you can get away with anything, Waffles. Waffles you should know by now that with girls what's yours is mine and what's mine is mine but I'm sure with your overload cuteness Glogirly gives you what you want!